KNL5series Residual Current Circuit Breaker(without over-current protection) is suitable for the line of A and S 50/60Hz, voltage 240V(2pole)/415V(4pole), rated current up to 63A. When there is human electricity shock or if the leakage current of the line exceeds the prescribed value, it will cut off the power rapidly to protect human safety and prevent the accident due to the current leakage. It can be used as infrequent changeover of the line in normal situation. It is applicable to industrial site, commercial site, tall building and civil house. It complies with standard of IEC/EN61008.1 and GB16916.1. Each phase of conductor at the Circuit Breaker passes through the zero-sequence current transformer, and the secondary side of coil connects with the electromagnetic tripper. Under normal condition, the vector sum of each phase of current passing through zero-sequence current transformer is zero. The flux of the zero-sequence current transformer is zero. 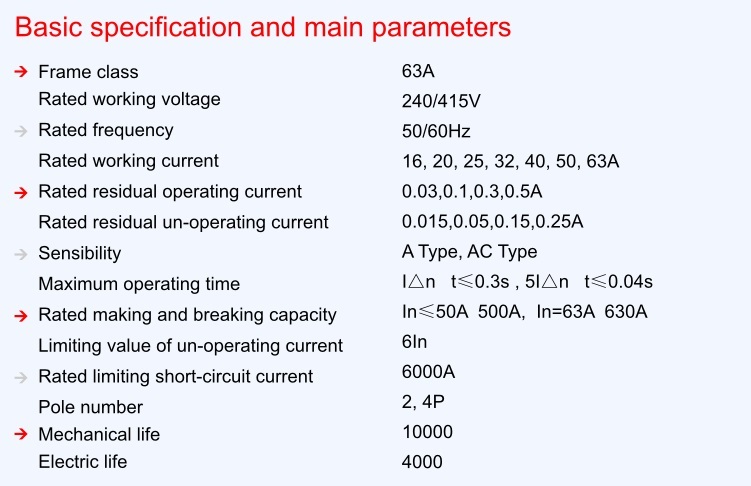 And the secondary output voltage is zero and the circuit breaker doesn't zero, and the zero-sequence current transformer would produce the magnetic flux, and the secondary side of coil would output the voltage. Once the leak current increases to drive the output voltage at the secondary side to grow to certain level, the electromagnetic release would activate to drive the operation mechanism to act to break the contact that connects the power, finally to realize the leak protection. Looking for ideal ID MAGNETIC ELCB Manufacturer & supplier ? We have a wide selection at great prices to help you get creative. All the RCD AC TYPE 63A 30MA are quality guaranteed. We are China Origin Factory of RCCB MAGNETIC TYPE. If you have any question, please feel free to contact us.